Since Latvia sat at the top of Knight Frank’s list of the fastest growing property prices in Europe for 2006, the little country is attracting a lot of interest from foreign buyers. Who can fail to be interested in a market where property prices grew by over 60% last year – more than double that of almost any other developing market? But just why did prices in Latvia grow so quickly? A fast growing economy. 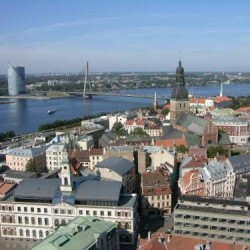 Latvia’s GDP increased by 10.2% in 2005, the highest in Europe. The country is receiving a lot of foreign investment which has put the economy on steroids. It’s simple to buy property. There are no barriers to foreigners buying property, no VAT, no Capital Gains Tax as long as you keep the property for at least a year, and the banks have been falling over one another to lend people money – up to 105% in some cases. With deals as good as this, the moderately wealthy locals find it easy to get on the property ladder. Rapidly growing tourism. There are now flights to Riga from London, Manchester, Liverpool, Glasgow and Dublin making it easy to get to Riga. The large Russian population in Latvia makes the country attractive to visitors from Russia as well. With all of these factors in Latvia’s favour, it’s perhaps not so surprising that Riga in particular has been such a success story with property buyers – both domestic and foreign. But, even with all of these advantages, there has to be a limit to how high the prices can go. OK, so we know the reasons why property prices have risen so quickly, but they are now the highest in the developing market. Does it look right to you that property prices in little Riga are so much higher than the more major Central European capitals such as Prague and Budapest, not to mention the Western Scandinavian cities of Stockholm, Helsinki and Copenhagen? Another potential worry is that rental yields aren’t growing at nearly the same rate as property prices. There is still good money to be made from renting to tourists at the moment, but the amount of money that long-term rentals can bring in seems to have just about reached its limit. Knight Frank were still very bullish about the Latvian property market at the start of the year though, predicting that it will increase by another 17.5% in 2007, second only to neighbouring Lithuania. It looked as if the good times were going to continue, with January another boom month, but then economists started to fear that the economy was running out of control, with rating agency Standard & Poor’s downgrading the country from an ‘A’ rating to a ‘BBB+’ rating. Other gloomier observers feared that the amount of credit handed out by the banks could lead to a banking crisis similar to that which toppled Asian markets in the late 90’s. In order to try and curb the country’s runaway inflation, the government introduced regulations, making it harder for the banks to give credit. In addition, the period that people had to own a property in order to avoid paying Capital Gains Tax was increased from 12 months to 5 years, making speculation a lot less profitable. The result was that property prices stopped escalating in April, with many people adopting a ‘wait and see’ attitude that has brought the number of transactions way down from their peak in January 2007. It’s no longer a seller’s market in Latvia any longer and prices are already starting to slip a little, although people don't seem to be panicking quite yet. Prices have been slipping by around 2-3% per month since their peak at the end of April 2007. Currently the market in Latvia is very slow as people are waiting to see how it develops. The fears of a hard landing together with rapid price depreciation don't seem to be happening as there does not seem to be a sense of panic developing on the market and observers believe that the steady decline should start to stabilize soon. Not all sections of the market are in the same situation, however. Although apartment prices aren't growing currently, there is still strong demand for suburban houses, which are proving to be increasingly popular with affluent local buyers. With the Latvian economy continuing to boom, the country should continue to see some good growth over the medium and long term. However, with the current nervousness in the market, and some analysts believing that prices are currently inflated by 20-30%, other markets in Eastern Europe have to be seen as being more attractive for anyone looking to purchase property today. If you are considering investing in Latvia, you are recommended to keep an eye on the news coming from the country. A lot of economists are getting very worried about the possibility of the market running into severe problems in the near future as the country gets more and more over-extended. You can keep abreast of developments in the market by checking out the articles in our News section where we’ve trawled the Internet for every story connected with property in Latvia so you don’t have to. By checking the news reports regularly and thinking through the consequences of each piece of news, you should be able to get a good idea as to how quickly or slowly property prices in the market are going to rise in the near future. The information in this section only tells half the story, however as only a small proportion of Latvian property news is translated in English, which means that the locals are getting a lot more useful information than foreigners are. Investing in the wrong markets could make the difference between making tens of thousands and losing tens of thousands over the next few years. If you’re seriously considering investing in Latvia, then you should think of subscribing to our Premium Service so that you can get all the breaking news from the market at the same time the Latvians are hearing it.